Black and White is such a great color combination. It’s instantly elegant even with the simplest materials. Here are some photos and products from this year’s KBIS that you can use in your black and white theme. 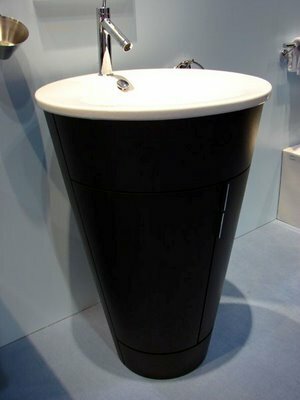 The Damask Remix Vessel Sink design by Cheryl Erikson-Wong for Wells Sinkware could be seen in the New Product Pavilion. These sinks are made by sandwiching the pattern between two layers of glass. The double layer of glass makes these sinks very durable as well. Ann Sacks displayed their Laque Tile. 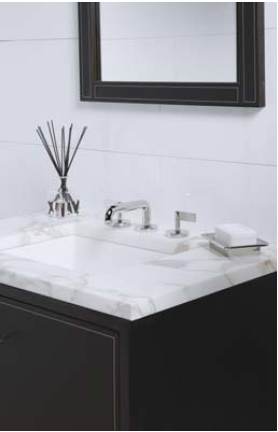 These dramatic lacquer wall tiles come in 12″x24″ format in black or white. These tiles are manufactured in a traditional Vietnamese style that dates back to the third and fourth centuries B.C. Each wood tiles receive 12-18 coats of lacquer and is hand polished to a warm glossy finish. These tiles are not for wet areas but work great for accent walls. This luxurious bath is from the Traditional Home Magazine vignette in the KBIS Design Idea Center. If you don’t have as much floor space you can incorporate the simple lines and stately elegance. Black glass chandeliers are at the top of the list of must-have chic accessories. This Vanity from Duravit is great for high style in small baths. I think this would look great with a damask print tile. One of the best things about using a black and white theme is that you can always change up your accessories to add some spice or give the room a new feeling. Red is a hot accent color right now. Most trend-spotters are crediting the upcoming Olympics for Red’s popularity.